Pram, Pushchair, Buggy, Stroller – What’s the difference? Three kids are a handful at any age but there’s a special craziness that comes along with having triplets or a little one with a set of twins. Having the right stroller may not come in handy during feeding or bath time but it will definitely help when it comes time to get out and about, from infancy all the way through toddlerhood. We have all seen a single stroller or a double stroller. But what about a triple stroller like a triple jogging stroller or triple baby stroller? There’s a lot to think about when it comes to choosing a triple stroller but remember one thing in particular. It has to be the right one for you and your babies. Look for a stroller that has independently adjustable seats and a shade that offers a lot of coverage to keep your little ones comfortable. Don’t forget about the things that you need, like an easy to clean fabric, ergonomic handle, and easy to maneuver design. 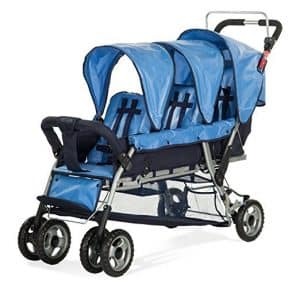 Let’s take a look at the top 5 strollers for triplets and tot trios that we have compiled. 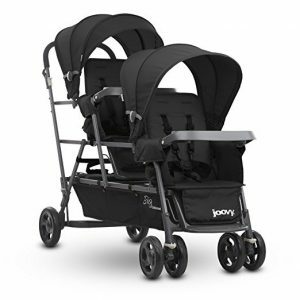 Our top pick is the OBaby Mercury Triple Stroller. This stroller can hold children from birth up to 33 pounds. Each of the 3 seats has a 5-point safety harness and independently adjustable back and leg rests. This means it’s not only a good option for triplets, it’s a great fit for families with little kids of different ages too. Whether you have toddler twins and a new baby, a toddler and new twins, or a brand new set of triplets, you can make each one of your babies comfortable. There are removable hoods on each seat too, which protect your passengers from the sun. It is also super easy to clean. This is a wide stroller so maneuverability is really important. To start with, the handles are ergonomically designed, comfortable, and easy to push. There are 4 wheels in the back and 4 in the front for an impressive 8 wheels in all. Plus, the front wheels swivel so they’re easy to steer. Underneath each seat is a storage basket so you have plenty of room to stash anything you need for your little ones. The folding mechanism adds even more convenience, making the stroller surprisingly compact so it’s easy to fit in your trunk or closet for storage. If you prefer a narrower stroller, there’s the Foundations Trio Sport Triple Tandem Stroller. Because the seats are lined up behind one another, this one is a little easier to maneuver through narrow spaces than a stroller that has the seats side by side. This stroller can even fit through standard doorways without any problems. Each seat can hold up to 40 pounds and the front and rear ones recline. The ergonomic handle helps you steer easily and the heavy-duty rubber foam wheels provide great shock absorption that gives your triplets a smooth ride. Each seat has an adjustable canopy that protects from UV rays and inclement weather and a 5-point harness to keep them safe and secure. There’s a large storage area underneath the seat, so you have room to keep anything you need for your babies. That’s not all, the durable tubing is really lightweight and folds down easily for storage and transport. If you have a tot trio that includes an older toddler with younger twin siblings, this is a great option for you. As long as one of your kids is able to stand on the back platform or sit on the rear bench seat, you can place your smaller children in the two main seats of this stroller. This makes it much easier to move around. 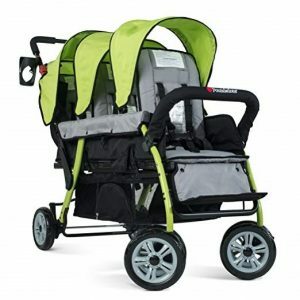 You can fit through doorways and make sharper turns that you couldn’t with a stroller that has three seats. Each of the front seats is designed for children over 6 months old and can hold up to 40 pounds. Each has two recline positions, adjustable footrests, and a tray with a cup holder and place for snacks. There are car seat adapters too, so you can use this stroller with compatible travel system car seats. The rear bench seat is designed for children 2.5 years and older, up to 45 pounds. Plus, there’s a large stowaway area so you can bring along everything you need when you’re out and about. 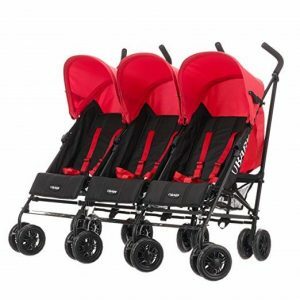 This triple stroller from Piroet is a top of the line product that is loaded with features that can make life with triplets just a little bit easier. The upgraded chassis has polyurethane wheels that turn 360 degrees and have durable tread. This makes it so it’s easy to steer and maneuver through doorways and small spaces. The seats are stylish and comfortable. Each has a reclining backrest and an adjustable footrest. Large hoods protect your little ones from the harsh sunlight plus each one is vented to help air flow through to keep them cool. Another cool thing about this stroller is that you can turn the seats so your kids look at you, each other, or out into the world. For added convenience, there’s an extra-large basket to store everything you need with three little kids and still have some room to bring some things along for yourself. Last up is the Child Craft Trio 3 Passenger Stroller. Each seat reclines independently and has an adjustable 5-part harness that grows with your child up to 40 pounds. Plus, there are three canopies to block out harsh sunlight and protect your little ones from UV rays. The fabric is really easy to clean, which is so important with kids, especially three of them. The rubberized foam wheels provide a smooth and comfortable ride. For safety, there’s a SafeBreak system that automatically engages when the stroller handle is released. For added convenience, there’s an extra-large storage area underneath plus the whole thing folds up quickly for easy storage and transport. Copyright 2019 by Busy City Mum.